As a result of my ongoing organizing effort, I am faced with the reality of “New Year Same Project(s)” situation!! I see projects I started before Miss Baby was born, and she is turning 9 this year… that shows you how old some of my projects are. So this year, I will working to reduce the reality of New Year Same Projects situation in my life! Here is one that I will be working on for the next two months. This projects uses almost all the blues out of the 270 Aurifil offers for embroidery floss. The pattern is Bois Le Duc by Long Dog Samplers for those who are interested. It is a sampler based on historical Dutch sampler motifs, many with Christian symbolism. I can only work on this a few minutes when I get some down time. One thing I find that has helped is to always make sure my needle is threaded when I stop — so that when I pick it up again everything is all ready to go. CURIOUS MIND WANTS TO KNOW WHAT TRICKS AND TIPS YOU MIGHT HAVE TO TACKLE THE UFO’s IN YOUR LIFE? 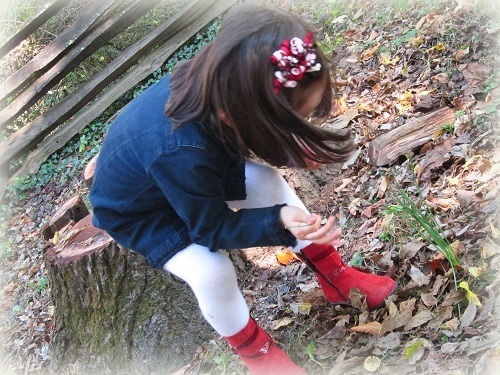 Miss Baby was always fascinated in plants and such (including dandelion!) when she was three, and she still is now! I have designed this Make A Wish quilt a few weeks ago using Windham Fabrics’ upcoming Botany fabrics. 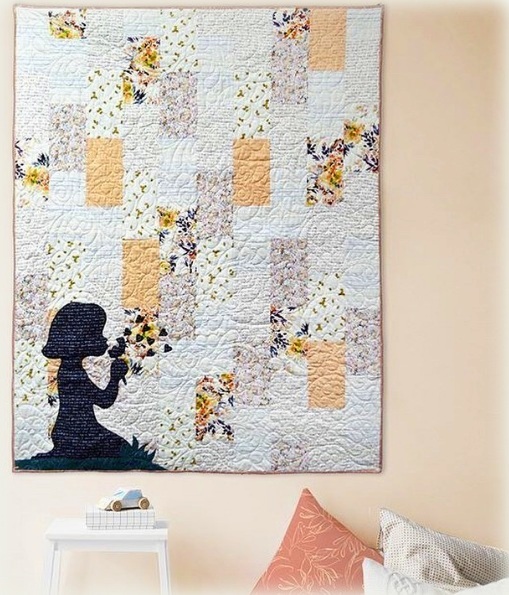 This quilt celebrates girl, and is inspired by Miss Baby, who can never pass up the chance to blow on a dandelion! The girl even has the hair much like Miss Baby’s usual hair style! Please note: This will be offered as a kit by Windham Fabrics! Pattern is part of the kit. And since fabric line doesn’t run indefinitely, if you are interested, you should get the kit while you can, and while it is offered. Ask your local quilt shops to contact Windham Fabrics about Make A Wish kits. Kits won’t be out for another couple of months, so be sure to check back on this site or my Instagram page for updated information. I have received many emails asking for past kit patterns. Unfortunately, those patterns for kits are often not available after the kits are gone. So, if you see something you like, the thing to do is to get the kits before they are sold out. With that…. I shall close out today’s post…. but not before I share with you a New Year Same Project situation that I proudly maintain in my life: spending time in God’s Word! Blessings to you all!! This entry was posted in Quilt kit, Quilt Pattern, Quilting, Quilts: Pieced & Applique and tagged Quilt kit, Quilting, Windham Fabrics. Bookmark the permalink. ← Happy New Year & GIVEAWAY! Sweet quilt inspired by Miss Baby! Unfinished projects and more unfinished projects, they are much like rabbits, they continue to multiply! Finishing was my goal last year, I got one completed. I hope to do better this year. I, too, have projects that are “years” old. I am proclaiming that 2018 is the year to “Finish UFO’s”!! However, it is also the year that I need to begin, and finish, a graduation quilt for my Grandson, who is the first of a string to be graduating from High School. Oh Dear, I better get with it. Really beautiful quilt design and fabrics. I love that it was inspired by Miss Baby. Such a sweet quilt. And your stitchery project is beautiful. Certainly looks like it will get finished this year. Your post title is perfect. If you get any tips or tricks for finishing UFO’s, I’m all ears. Last year I set a goal to complete 3 UFOs for every new project I started. Helped, but I didn’t stay focused. This year I’m trying to focus on a UFO every week. So far (< 2 weeks) it has worked). LOL. UFOs! Last year was my year for UFOs. Because we move a fair bit, I can easily tell how old a project is by knowing where I started it (mystery quilt with this guild, or project started with this friend, focus fabric found at this store). All are clues to how long I’ve been working on a project. Some of mine are going on 10 years. But I’m proud to say that last year I finished 7 of my UFOs and have another 4 quilted and waiting only for binding. I’m determined to either finish up my ufos, or allow myself give away projects I’m no longer interested in. Sorry for the long comment, but I’m passionate about finishing my ufos this year!!!! God has blessed you richly Wendy. I love how you share your talents and faith with your readers. And your Make a Wish quilt is fabulous! Hi Wendy, I don’t have any tricks about UFO’s, just have to get it done! In 2017, I did finished some of UFOs and will continue to do that in 2018, meanwhile, trying not to adding too many new projects. I know, my eyes are always bigger than my stomach! haha… By the way, your Make A Wish quilt is very inspiring. Have a wonderful day. 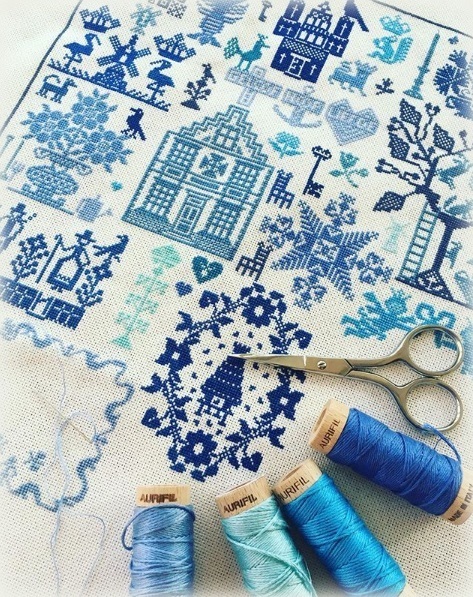 Your stitchery project is absolutely gorgeous! It will go so well with your blue and white dishes! Back when I was cross stitching a lot, my trick was to do one length of thread a day (say 18″ of thread). And as you said, threading it the day before, so it is ready to go, is so freeing! I love your new kit. Hello Wendy; Such a beautiful quilt you are working on to finish. I am trying to work on my first goal of organizing and downsizing fabrics I know will never be used by me and donate them to my Project Linus guild. Then the UFO’s. I look forward to seeing all of the projects that you share with us this year! Have a fantastic day! I ALWAYS start the year off working on UFO’s , but something more “pressing” often gets in the way. I am currently finally finishing up a UFO that was started 2006! So you know how old that one is. It is a king size quilting that has lots of New York Beauty blocks that were pp so that took a long time, and then I am quilting it myself on my domestic machine..I do expect to have it done as I just have the borders to finish quilting, in 2018!! I have let my stitching slide. I have trouble seeing to stitch, even with glasses and a magnifier, but I’d like to get a couple of more projects done. I love that quilt and thought the girl looked a lot like Miss Baby! I love to piece quilts but dislike quilting them. Therefore I have a backlog of tops. For the last year I’ve made myself try to finish a sitting top before starting a new project. I’m also trying to completely finish a project before starting another. I’ve done somewhat better but have to keep working on getting those old projects completed. Love that quilt! Thanks, too, for the reminder of how important it is to make time for God’s word. I have really been convicted about that lately (even Sunday’s sermon!). Even that dandelion is a reminder of new beginnings! Thanks! I have a ridiculous number of UFO’s and my goal is to take a bite out of the list this year. I have a pile of tops that need quilting. It is all very daunting. I like starting new things too much. I am really going to try!! Hello Dear Wendy, I love the needle work, I love the quilt, and I love Miss Baby. I love you too. Thanks for the pointer to Long Dog Samplers–makes me want to cross-stitch again. I was thinking about you this morning, and then this popped in my email. I’m glad to see you are keeping busy, and can’t believe G is almost 9. When did that happen?? I’m also trying to finish some UFOs and made the list, hoping to tackle one or 2 a month, in addition to my new stuff and deadline projects. This month has too many deadlines, so I’m getting them done first. If there are still days left, I’ll finish a UFO, too. Need to get them crossed off the list! Hugs, and happy stitching! Said, , but I still can’t find it! Of Miss Baby!! I have a Miss Grandbaby far away.. I was so happy to hear you were able to spend Christmas with your Mom!!! Thank you for sharing your stories and talent through the years! I have enjoyed watching Miss Baby with all of your beautiful quilts! I just love that quilt, Wendy. I have way to many same project, new year projects around here. Very inspirational post. Make A Wish is gorgeous. I am also attempting to finish all (most) of those UFO quilt tops that have accumulated, lol.